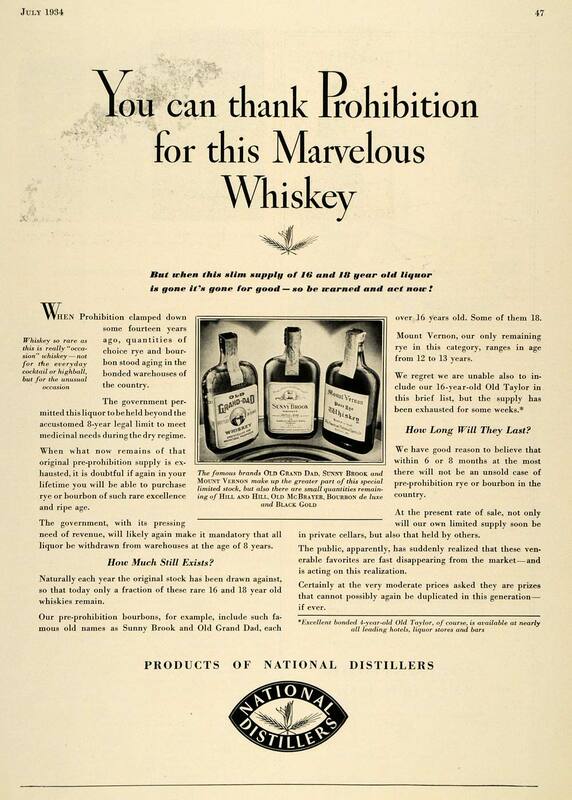 Being a marketing guy by trade, I really admire these old advertisements from National Distillers (circa July 1934). Create sense of urgency. Check. Weave a tale of romantic scarcity. Check. Create F.U.D. (Fear, Uncertainty, Doubt). Check. The only gaff by today’s standards is the typical wail of the modern ad agency client: “There’s way too much text. Nobody’s ever going to read all that.” Thanks, Internet. Personally, I read every word of these ads with the same savory satisfaction I get from slow sipping my new found friend: Evan Williams Single Barrel. Please forgive the alliteration indulgence. Anyway, this ad predates my first post of this ad campaign by about 3 months. I think this is the first one in the series as I’ve found a couple more that were published at later dates. They just get better over time like whiskey in the wood. Get yours while it lasts! than the ND one you’ve posted though. Yes! I love these advertisements. 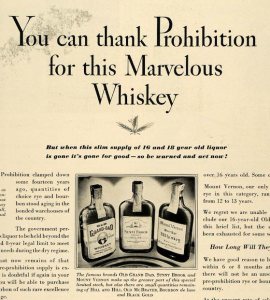 What is interesting about the Thompson Straight Whiskey ad is it is pre-prohibition. They KNEW that prohibition was coming. So, pre and post prohibition ads selling the scarcity of pre-pro juice. I have two more ads I’m going to post along with a neck hang tag from and AMS bottle from this era that matches the campaign down to the typestyle. I agree! I love reading old ad copy; it’s half the fun at least. I belong to a Facebook group where we post and comment on old avertising, and I tend to get prickly when the photo is so blurry you can’t read the text. It seems to happen on what would otherwise be the most interesting submissions.